This Schlocktober, Psycho Drive-In will be exploring the world of horror cinema, featuring thirty one notable films released between Halloween 2012 and Halloween 2013. Next up is director/co-writerJim Mickle‘s We Are What We Are. The writing/directing team of Nick Damici and Jim Mickle are a force to watch and be reckoned with. I have yet to see their first feature, Mulberry Street (2006), but 2010’s Stake Land was amazing for a low-budget post-apocalyptic road film. Their follow-up, We Are What We Are, is a remake of the Mexican film Somos Lo Que Hay (2010), about a family of cannibals dealing with a conflict between the changing times and their traditions. 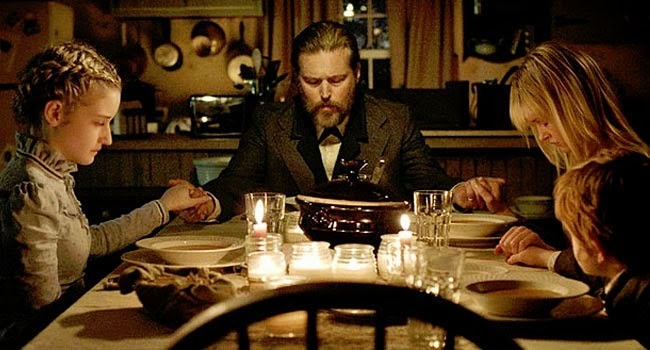 The original was a pretty creepy story that drew a stark contrast between the ultra-conservative religious fervor of the cannibal family elders compared to the comparatively hedonistic modern culture by focusing on the sons – one of whom is questioning his sexual preference – and their struggles bridging the two worlds. Along with this there was a focus on gender roles in the family itself along with a healthy dose of comedic criticism of the police and other authorities in Mexican society. As such, it was entertaining, but stumbled from tonal shifts that were difficult to reconcile. Mickle and Damici, by taking the story from the streets of Mexico City to the backwoods of the American South, removed the social commentary and instead focused on the internal struggles of the family. They also flipped the genders of the main characters, removing nearly all of the gender issues raised by the original, since with their version, it’s the women of the family who already do the hunting (so the original’s commentary about the women taking on masculine roles is abandoned). What we have here, then, is a very serious, very focused horror film that is more interested in exploring the internal struggles of this family, the Parkers, than in providing general social criticism. And you know what? It works. It works almost too well, actually. It is so grounded in realism that the sudden shift in tone in the closing minutes was a bit too jarring to ring true, given what had come before. But that’s a minor quibble, really. The rest of this film is very well done with strong, natural performances from everyone involved. The daughters Rose and Iris, played by Julia Garner and Ambyr Childers, carry a lot of the emotional weight of the film as they struggle to take on the role of hunters after the death of their mother (Kassie DePaiva) from the degenerative disease Kuru. Bill Sage plays the father, Frank, with an honest earnestness and a surprising vulnerability. Continuing her professional relationship with Mickle and Damici, Kelly McGillis also has a small, but important role as a neighbor who comes to a tragic end. As good as they all are, I have to admit that my favorite performance is that of Michael Parks as Doc Barrow. In my book, Michael Parks can do no wrong. Every time he’s on screen, in this film or any other, he just becomes impossible to ignore. And as Doc Barrow begins discovering clues that maybe his daughter, who vanished years earlier, may have been killed and eaten by the Parkers, the slow boil of anger that rises up is played to perfection. His confrontation with Sage over the dinner table is intense and powerful; a high point in the film as a whole. The use of the constant rain and the flooding of the area as thematic elements never gets heavy-handed and enhances the beauty of the landscape rising up around these characters. As he did with Stake Land, cinematographer Ryan Samul is able to utilize the natural environment in ways that elevate the material and get the most out of limited budgets, making We Are What We Are one of the best-looking cannibal films you’re ever going to see.